There was talk that the JOBS Act would move small business startups away from venture capitalists and toward crowdsourcing options. It appears it’s not an either/or situation but both/and. While I mentioned crowdsourced consulting in an earlier post, it seems we have another similar company. 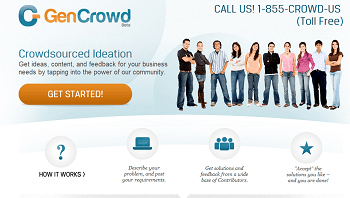 GenCrowd is also provides crowdsourced outsourcing for small business startups. It’s unclear from their website whether they’re familiar with their competitors or what their USP might be over them. They have a similar story from the previously mentioned AskYourUsers.com. “The volume of work that startups have to do, atleast initially – from idea brainstorming and validation, brand naming, tagline and slogan generation, logo design, web design and development, content and copywriting, all the way down to website and usability testing, SEO and marketing, analytics research, customer service, and a whole bunch of other issues – can take a real toll on people and businesses alike,” said Barun Rath, founder of GenCrowd. GenCrowd seems different in that it allows “blind” listings which means you can solicit feedback without any of the experts being able to see each others’ solutions. Of course it’s hard to beat AYU’s ties with LinkedIn – whatever that benefit might be. It seems to go without saying that we prefer working with people we know when that’s an option. But to extrapolate that to the conclusion that crowdsourcing isn’t gaining traction does small business startups a disservice. It’s zero sum thinking. Before, venture capitalists were the main game in town. You may have got funding based on your relationships with them. Of course you had to have a solid idea too. But the relationship needed to be there. With crowdsourcing, a whole new source of funding is opening up to the market. People without prior VC relationships will now have options where they can prove their idea and expertise. Of course there’s the debate about preferred startup CEO ages. If anyone does a demographic study on that, I’d like to know. One I saw said the average age of startup CEOs from 1995-2005 was 39 but that older professionals start different kinds of companies than younger ones. Clearly the older ones are going to be the ones more likely to seek funding and in all likelihood, the younger ones be more inclined to pursue crowdsourcing for small business startups. There were a couple of articles today on starting as an entrepreneur. 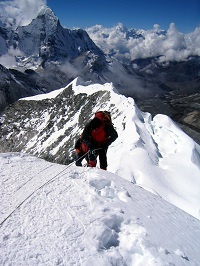 One was geared toward showing investors the entrepreneur is committed. The other was on ways NOT to start as an entrepreneur. Both are useful as self examination tools even if you’re not currently starting a business. If you have an existing business, you can consider whether you still have what it takes to make it as an entrepreneur. Since investors at the beginning of a venture are betting on the small business idea rather than an established system, they want to know the idea is fully supported by the person who came up with it. These are some ways investors judge someone to be fully committed to his idea. Even if you’re not looking for venture capital, this is a good way to examine yourself to see if you’re giving it enough to really get things going and grow your small business. One has to admire entrepreneurs who are willing to have 10 or 20 rejections for every lead they receive. Nothing creates more entrepreneurial believability than a passionate belief in an opportunity. That does not necessarily mean the venture is a good investment, but I would much rather back entrepreneurs who are willing to spend years on an opportunity, and show genuine resilience, rather than those who give up after a few setbacks. The ability to recover from failure, in a country that, sadly, has little tolerance for honest entrepreneurial failure, is especially impressive. What makes a real entrepreneur believable? While it’s entirely possible to start a business without going all in, putting it all on the line is what people want to see if they’re going to give you money to do it. They want the best opportunity for success. In truth though, many small businesses are started by individuals with their own money part-time. That’s part of what makes business great – there are lots of ways to get it right. What you can’t do is start without a clear idea of how you’ll connect with and provide value to your customers. Without a way to provide value or make a sale, it doesn’t matter if you have 100 people working on it full time. But then that’s probably the first rule of being an entrepreneur and you probably already know that.